Myles Turner didn’t waste much time getting back to work following the conclusion of the 2017-18 NBA season. Just a few weeks after the Pacers exit from the playoffs, Turner showed his shocking transformation on Twitter. Turner credits his revamped, highly organized diet plan to his weight loss, but he’s also been putting in significant work to build muscle through weight training and cardio. Despite his work in the weight room, it’s been Turner’s non-traditional training methods of Yoga, Boxing, and even a workout on a football field that have developed a more lean and toned figure. On the gridiron, Turner showed off enough arm strength to intimidate Colts QB, Andrew Luck. 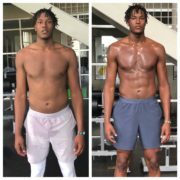 Myles new transformation was shown and discussed on numerous NBA sites such as Ball is Life and Inside the NBA with Rachel Nichols.